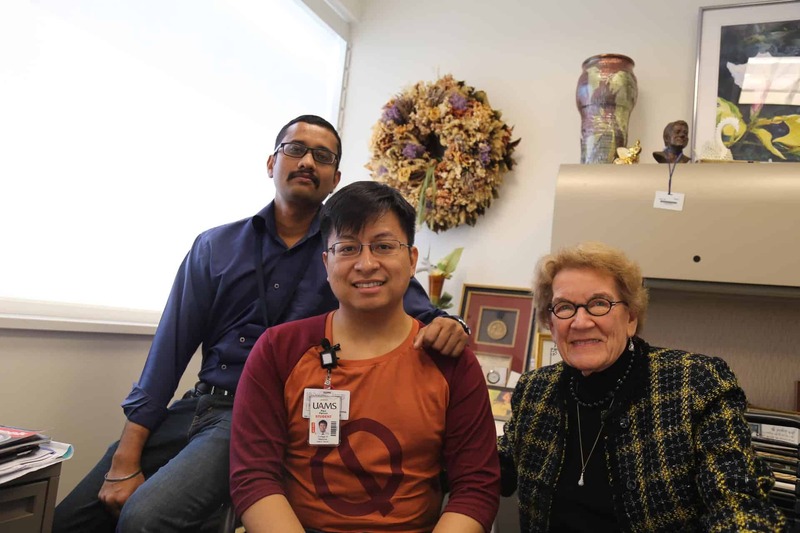 Meenakshisundaram Balasubramaniam, Ph.D (left) Paul Parcon, M.D, Ph.D. candidate and Sue Griffin, Ph.D.
May. 21, 2018 | LITTLE ROCK — University of Arkansas for Medical Sciences (UAMS) researchers led by Sue Griffin, Ph.D., have found a way to illustrate how a protein known to be a risk factor for Alzheimer’s disease interacts with DNA. Sue Griffin, Ph.D., is an internationally known Alzheimer’s disease researcher at UAMS. The findings were published February 2018 in Alzheimer’s and Dementia, the Journal of the Alzheimer’s Association. Apolipoprotein E, more commonly known as ApoE, is a protein in the body responsible for carrying cholesterol and other fats through the bloodstream and is the main protein for supplying lipids to brain cells. Everyone has two copies of the gene for ApoE, one inherited from each parent. Most people have two copies of ApoE3, considered to be associated with average risk for development of Alzheimer’s. But 10-15 percent of the population has at least one copy of the gene for ApoE4. That population is three times as likely to develop Alzheimer’s, and will tend to develop symptoms at an earlier age. The risk increases to 12 times for those who have two copies of ApoE4. Abnormal clusters of plaques and tangles are the characteristic finding in Alzheimer’s. Griffin’s group noticed that patient carriers of ApoE4 had significantly more of these plaques and tangles built up between and within nerve cells, along with fewer nerve cells. She said the discovery of more plaques and tangles in people with two copies of ApoE4 gets scientists closer to answering the question: Why are people with the ApoE4 gene at a higher risk? Griffin and graduate student Paul Parcon were discussing their ideas over lunch one day when Parcon, an M.D. Ph.D. candidate, suggested the problem might be caused by a disruption of autophagy, the process by which cells get rid of proteins that are no longer needed. Parcon and Griffin began looking at what could be causing that failure. Griffin said that three proteins are necessary for autophagy, all three of these proteins are made from an interaction between a transcription factor and a specific DNA sequence, and Parcon proposed that this interaction could be affected by ApoE4. Meenakshisundaram Balasubramaniam, Ph.D., a computational biologist and postdoctoral fellow at the lab of Robert J. Shmookler-Reis, D. Phil., in the College of Medicine’s Department of Geriatrics, is a co-author with Griffin, Reis, Parcon and Ayyadeva. Balasubramaniam told them he could simulate what was happening at the molecular level by using advanced computational tools running on high-performance super computers. Balasubramaniam says they not only predicted the ApoE4 interaction in the simulation, they proved it using the experimental approach in the research paper. The researchers hope this finding will be the first step in developing a drug that would treat those with Alzheimer’s disease. “Now that we know it is the ApoE4 protein that is interacting with the DNA, we may be able to model a molecule to block that interaction so that the cells may then function normally,” Parcon said.